Facilitators: Andrea Warnick, RN., MA., Liana Lowenstein, MSW., RSW., CPT-S., Lysa Toye, MSW., RSW., Rev. Andrew Blake and Esther Rhee, MSW. In this 5-module certificate program, you must complete all 5 modules to obtain the certificate. Please note: the individual modules can be taken separately but you will not receive the certificate. Overview: Grief is a confusing and isolating experience for any person, old or young. Children's grief, however, differs considerably from adult grief, resulting in the needs of grieving children often being overlooked or misunderstood. This can have a profound impact on the social and emotional development of a child. Caregivers, including the most skilled professionals, often feel helpless when supporting children through the death of someone close to them. The Certificate Program in Children's Grief and Bereavement explores the roots of our cultural discomfort with the topic of children and death and exposes common myths and misconceptions. 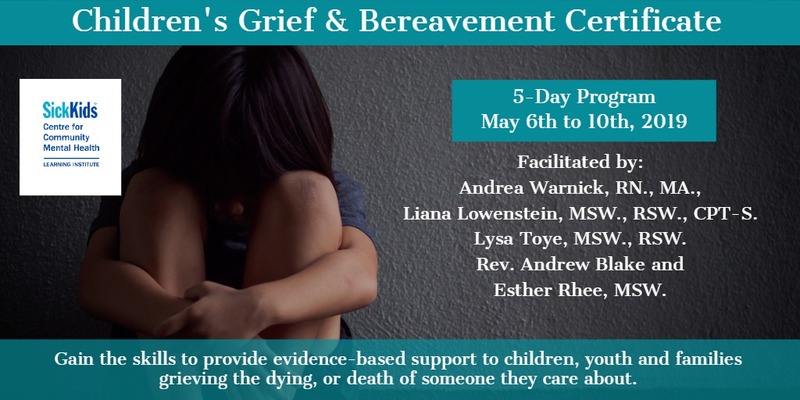 This certificate program equips you with skills to provide evidence-based support to children, youth and families grieving the dying or death of someone they care about. Adults cannot change the reality of a death occurring in a child's life, but with the right tools they can play a powerful role in shaping the story of the child's grief experience and therefore help the child thrive in life. Date: May 6, 2019 | Presenter: Andrea Warnick, RN., MA. Overview: Supporting children and youth who are experiencing the dying of someone close to them is a challenging experience across all disciplines, even for the most skilled professional. There is a growing body of research encouraging authenticity, honesty and inclusion of children experiencing a death. Yet too often children and youth remain excluded from the experience of illness, dying and death, leading to a sense of alienation for the child and a missed opportunity for their growth and connection. In our intent of protecting, we often unintentionally unplug the child from relationships both prematurely and unnaturally. 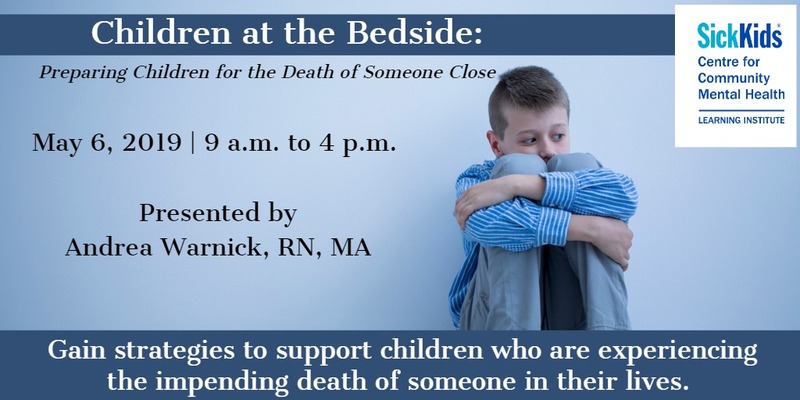 Real-life and real death narratives will be used throughout this workshop to identify practical strategies that can be used to support children and youth who are experiencing the impending death of someone in their lives. The roots of our societal discomfort with the topic of children and death. Myths and misconceptions which create barriers to children being included at the bedside of someone who is dying. Practical strategies and creative approaches for preparing children for a death, including a death through Medical Assistance in Dying. Literary, web, and local resources for supporting children who are experiencing the dying of someone close to them. 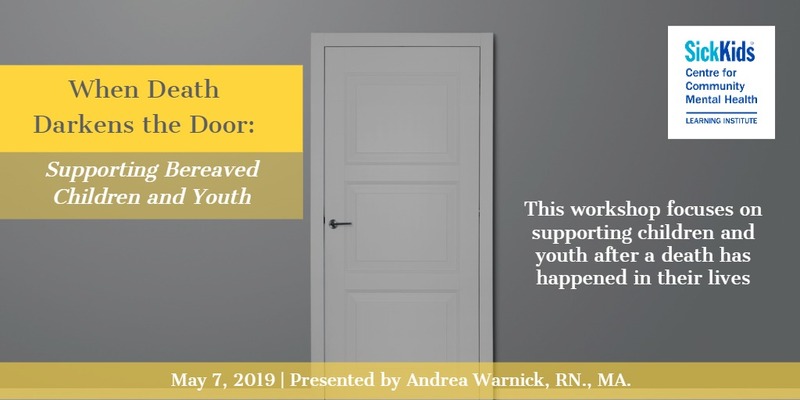 Date: May 7, 2019 | Presenter: Andrea Warnick, RN., MA. Overview: The death of a significant person represents one of the most powerful disruptions in all aspects of a child or youth’s emotional existence. Yet few professionals, whether in the field of mental health, medicine, or education, receive formal training on how to support bereaved children and youth. The focus of this workshop will be on supporting children and youth after a death has happened in their lives, regardless of whether the death was a recent event or occurred years ago. This workshop will identify grief support strategies that can be used with children and youth in a wide variety of settings. “What not to say” to a grieving child, youth, or family member will also be highlighted. Stories and important messages from children and youth that illustrate “best practice” guidelines for supporting a healthy grief process will be shared. Innovative and practical tips for helping children and youth understand the concept of death, and for supporting their grief process. Strategies for preparing children and youth for funerals, memorials and other ceremonies. What not to say to a bereaved child or youth. Literary, web, and local supports available to children and youth who have experienced a death. Overview: Much of our training in empathy focuses on “being fully” in another's shoes. Leading neuroscientific research exploring the pathways of empathy and compassion tells us a different story. Overwhelming evidence also points to the significance of mindfulness in establishing the skill of “being present”, which is an essential component of providing grief support. When awareness is balanced between self and other, compassion has a dual pathway, where our care extends both to ourselves and to those in our care. In addition to the use of compassion in clinical work, mindfulness practices that can be used with children, adolescents and families will be explored, as will the link with the clinician’s own mindful practice. Essential skills in bringing mindfulness, healthy empathy, and compassion into their lives. Strategies for developing open presence and deep listening in their work. Benefits and limitations of empathy and compassion through the lens of neuroscience, including how mindfulness enables us to remain grounded and open in the face of suffering and distress. 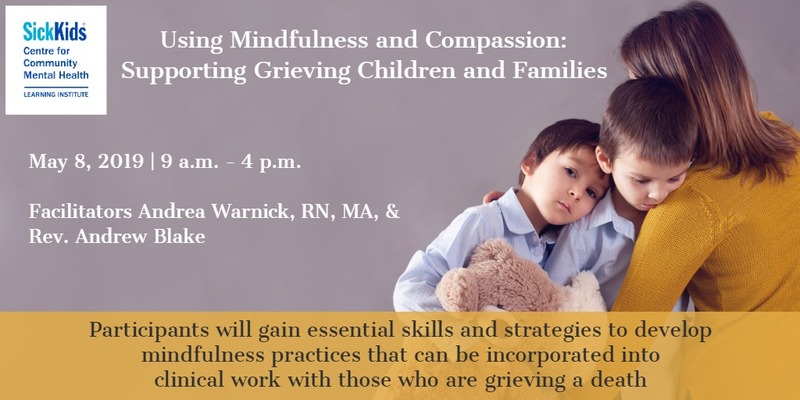 Mindfulness practices that can be incorporated into clinical work with children, youth and families who are grieving a death. Date: May 9, 2019 | Presenters: Andrea Warnick, RN., MA., Liana Lowenstein, MSW., RSW., CPT-S., and Esther Rhee, MSW. 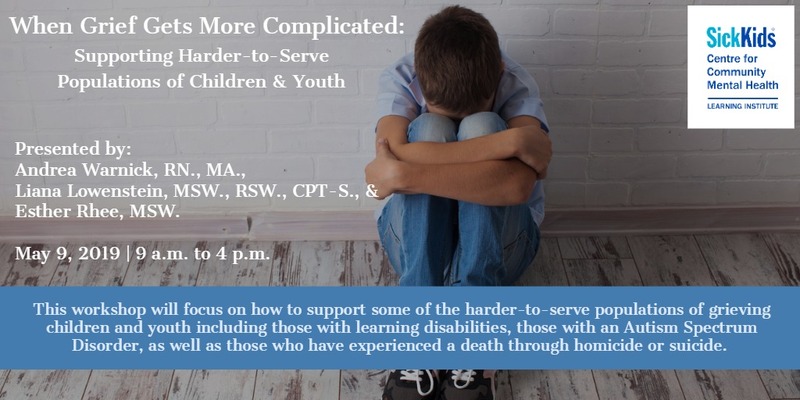 Overview: This workshop will focus on how to support some of the harder-to-serve populations of grieving children and youth including youth those with learning disabilities, those with an Autism Spectrum Disorder, as well as those who have experienced a death through suicide. The concept of “Complicated Grief” will be touched on, and ways of identifying when a child may be experiencing Childhood Traumatic Grief (CTG) will be highlighted. Please note that while this workshop will be trauma-informed, the emphasis will be on recognizing, not treating, children and youth who are experiencing CTG. Clinical examples, practical tools and resources will be shared through small and large group discussion with the aim of enhancing participant’s confidence in their ability to provide grief support in clinically challenging situations. Support strategies and resources for some of the harder-to-serve populations of grieving children and youth such as those with an Autism Spectrum Disorder, Learning Disability, and/or grief related to suicide. Ways of identifying Childhood Traumatic Grief (CTG). Literary, web, and local community supports available to support these populations of grieving children and youth. Date: May 10, 2019 | Presenters: Andrea Warnick, RN., MA., and Lysa Toye, MSW., RSW. Overview: Play, creativity and the arts have a unique capacity to respond to human suffering, and offer experimental spaces for the exploration of ideas, feelings and questions around the experiences of death and grief. 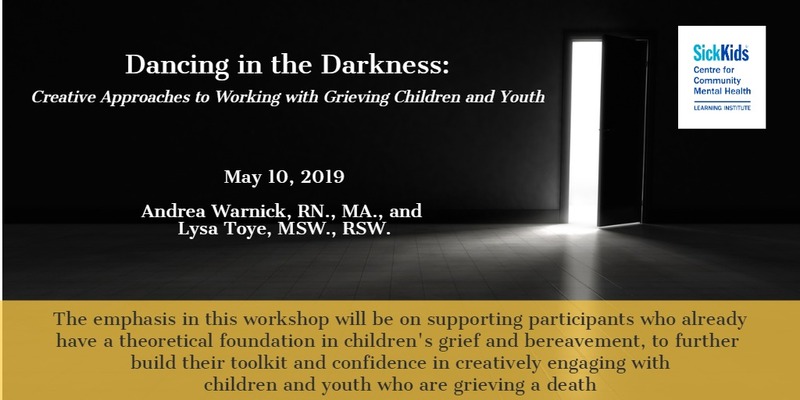 The emphasis in this workshop will be on supporting participants who already have a theoretical foundation in children’s grief and bereavement to build their toolkit and confidence in creatively engaging with children and youth who are grieving a death. Play based, arts based and other creative approaches to both psycho-education and counseling/psychotherapy will be explored during this experiential, daylong workshop. Ways of using such approaches to facilitate grief education and support in schools will be shared, and the ever-emerging pros and cons of Thanatechnology will be touched on. Many easy to use (and modify) creative techniques in working with grieving children and youth will be shared, and participants will have the opportunity to engage in safe, experiential activities to better understand the process of using creative approaches. No art experience is required. Creative approaches to supporting children and youth who are grieving the dying or death of someone in their life. Art and play based strategies to add to the tool box of participants who already have a theoretical foundation in children’s grief and bereavement. Strategies for supporting grieving children and youth in schools. Find more information on registration fees, agenda and facilitators within the tabs located at the top/left of this page.